ٹریٹفورڈ وسلم ایون کے شیکسپیئر کے گھر کے شہر میں, ان کی زندگی اور کام رائل شیکسپیئر کمپنی اور شیکسپیئر پیمستان ٹرسٹ کی طرف سے سال بھر منایا جاتا ہے. The Royal Shakespeare Company is one of the world’s best known theatre companies, شیکسپیئر کے ساتھ لوگوں کو منسلک کرنے اور جرات مندانہ کی پیداوار, زندہ لکھنے والوں کے ساتھ جرات مندانہ کام, اداکاروں اور فنکاروں. شیکسپیئر پیمستان ٹرسٹ بقایا محفوظ شدہ دستاویزات اور لائبریری کے مجموعے کے ساتھ ایک منفرد شیکسپیئر مرکوز تجربہ فراہم کرتا ہے, تمام براہ راست شیکسپیئر سے متعلق متاثر کن تعلیمی اور ادبی واقعہ پروگرام اور پانچ شاندار گھروں. The far reaching impact that Shakespeare’s writings have had on people’s lives across the world is widely recognized and evident from the seemingly endless number of theatres, تہوار, اداروں اور ان کے نام کرنے کے لئے وقف کر رہے ہیں کہ دیگر تنظیموں. Please check back here shortly for activities being held on Saturday 27 اپریل, 2019. To mark شیکسپیئر کے 455ویں سالگرہ, the Shakespeare Birthplace Trust has planned a special programme of celebrations in honour of Stratford’s most famous son and the world’s greatest playwright, with a vibrant mix of entertainment and performance. مفت, خاندان دوستانہ پروگرام Henley کی سٹریٹ میں سارا دن چلایا جائے گا, right in front of the very house where Shakespeare was born. ہفتہ کے دن, 27 April Henley Street will come alive with an exciting line-up of pageantry and performance. Kicking-off this year’s celebrations at 9.30am will be traditional country dancing by local school children. The birthday parade will arrive at Shakespeare’s Birthplace at around 10.30am, where ‘Mr Shakespeare’ will call in to collect the ceremonial laurel wreath and lead the parade down Henley Street. The gates to ہال کی Croft کے garden will reopen for the annual Knights and Nymphs children’s party. Popular with families, there’s plenty of fun to be had with a dressing up box, face painting, garden games and delicious treats including a barbecue and fizz for the grown-ups. Entrance to the garden is free. Throughout the weekend of 27 اور 28 اپریل, ٹریٹفورڈ وسلم ایون (CV37) residents can also take advantage of free entry to all five Shakespeare Family Homes and a slice of birthday cake, اسٹاک آخری جبکہ. Proof of address required. The Shakespeare Birthday Lecture takes place at the Shakespeare Institute on Friday, 26 4pm میں اپریل, featuring special guest speaker and this year’s Pragnell Shakespeare Award recipient, Professor Jerzy Limon O.B.E., founder and artistic director of the Gdansk Shakespeare Theatre in Poland, پروفیسر مائیکل Dobson کی کے ساتھ بات چیت میں, Director of the Shakespeare Institute. 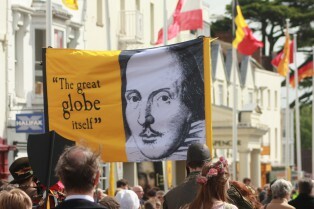 Tickets cost £10 and are available to purchase online at www.shakespeare.org.uk or by calling 01789 339804. ٹکٹ: £ 10; SBT Friends £8 www.shakespeare.org.uk/whatson یا کال 01789 339804. Join Professor Jerzy Limon O.B.E., founder and artistic director of the Gdansk Shakespeare Theatre in Poland, پروفیسر مائیکل Dobson کی کے ساتھ بات چیت میں. Presented in partnership with the University of Birmingham. The Shakespeare Birthplace Trust is the independent charity that cares for the world’s greatest Shakespeare heritage in his home town of Stratford-upon-Avon. It is the global centre for learning about and experiencing the works, life and times of the world’s best-known writer. Through the five historic Shakespeare family homes (شیکسپیئر کی جائے پیدائش, Shakespeare’s New Place, این ہیتھ وے کاٹیج, Mary Arden’s Farm, ہال کی Croft کے), internationally designated museum, library and archive collections, award-winning learning programmes and digital channels, it provides imaginative, immersive and interactive opportunities for people of all ages and backgrounds to get up-close-and-personal with Shakespeare. The Shakespeare Birthplace Trust is a self-sustaining charity which generates 98% of its income through the support of visitors, donors, volunteers and Friends. In April 2018 it was granted National Portfolio funding from Arts Council England for the first time, enabling new creative and outreach programmes with a particular focus on communities which are currently less engaged in arts, culture and heritage. مزید معلومات کے لئے, دورہ www.shakespeare.org.uk or follow us on social media @ShakespeareBT.